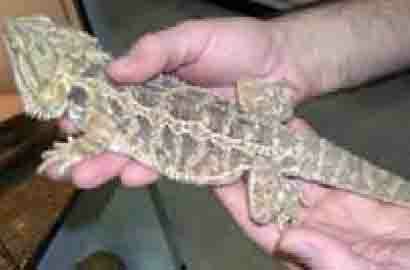 A Pet Bearded Dragon is one of the most popular lizards to own. Beardies are from central Australia and will grow to 16 to 22 inches with a life span of 7 to 10 years (females are slightly smaller). These extremely popular pet lizards are relatively easy to care for given their pleasant temperament. They do require a large 75 gallon to 120 gallon terrarium that resembles the desert savanna type environment (desert and dry forest, scrub lands). They dwell on the ground, and will climb on lower branches and rocks. Adults mature between month 10 and 18. The reptile is most active during the day. In the wild, Bearded Dragons will look for food in the AM and afternoon, and spend the hot part of the day underground in an burrow. The lizard does well in captivity and are relatively easy to care for. The lizard's temperament is calm and they do not stress when handled. A Pet Bearded Dragon requires a hot, dry or savanna like environment in a long and wide cage. It doesn't not have to be tall. The cage does require a secure screen top. Look for a 10 gallon to 15 gallon lizard terrarium for raising babies. 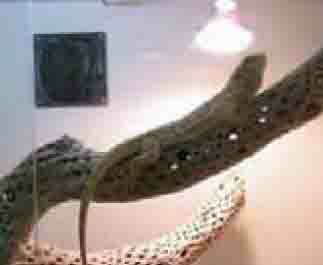 As the lizard grows, a larger terrarium is required with the minimum floor space being 18 x 48 inches (46x122 cm). In gallons a bearded dragon terrarium should be at least 75 gallons or larger. We suggest keeping only 1 male per cage, but there can be 2 females. If 2 males are housed together, there can be dominance problems. Breeders often house 2 males together since this can stimulate reproduction. Substrate: A pet Bearded Dragon will ingest any substrate made of small particles. For this reason do not use these types of covering; reptile sand, cat litter, walnut shell, wood shavings, gravel or wood chips. Preferred substrates are newspaper, reptile carpet, alfalfa pellets, cypress mulch or sterile potting soil if it can be disposed of with every cage cleaning. Decor and Furniture: Cages should include basking rocks that are glued down so that they cannot move and injure the lizard (use silicon to glue on place). The bearded dragon cage should include climbing branches and a hiding shelter. Plants that thrive in this type of arid environment includes sansevieria, aloe, palms, and cycads. Hiding Box: A pet bearded dragon terrarium should contain a hiding box. Wood hiding boxes can be periodically soaked in water to improve humidity levels. Lighting: Bearded Dragons require direct sunlight or UVB light (no less than 5% UVB on package) in order to properly metabolize calcium. Sunlight that passes through windows or Plexiglas do not provide the required UV light. Recommended brands include the fluorescent UV light ZooMed ReptiSun 5.0 or the Mercury vapor bulb based ZooMed PowerSun. Fluorescent UV light should be located 18 - 20 inches from the lizard. Change fluorescent bulbs every 6 months when the lizard is young, and 1x per year as an adult. If using a Mercury Vapor bulb, change the bulb every year. Water: Provide a water pan that will allow the entire pet bearded dragon to soak at least 1 to 2 times per week. Unfortunately, the lizard will drop feces in the water, so be sure to clean daily and disinfect the water pan with bleach weekly. Some bearded dragons will not drink from a water dish. To hydrate these lizards, provide the soaking pan and rinse any greens with water just before feeding so that the lizard ingests the water droplets. Humidity: Any Pet Bearded Dragon cage should be well ventilated with humidity at 40% to 60% RH). Note that sand or newspaper could decrease cage humidity. Keep burrows and hiding boxes more humid than the rest of the bearded dragon terrarium. Do not let temperatures fall below 70F. During the day, the best approach is a temperature gradient with the cool side at 80F, moving to the heated side at 95F. Young Lizards require a good amount of food to fuel their growth. They are approximately 3 inches at birth. By the end of month 2 they will be twice the length. They will reach full size (1 to 2 feet) after a year. The nails do need to be clipped. Cat claw trimmers are the best way to clip the nails. Do not clip too close to the foot. Bleeding can be stopped by applying corn starch. Nails should be clipped ever few weeks. A pet Bearded dragon is an omnivore when a juvenile, feeding primarily on crickets and greens. The adult bearded dragon diet is mostly herbivorous, with some insects. Do not feed lightening bugs to Bearded Dragons. The fruits and plants listed below can be added as an occasional treat. All food should be provided in a shallow dish to avoid the lizard ingesting any cage substrate with the food. At first, feed small crickets such as pinhead crickets and tiny just molted worms. Over time, the food can be increased in size. Crickets should be no larger than the space between the lizard's eyes. If large crickets are swallowed whole they can cause health problems such as partial paralysis, loss of motor control, inability to self-feed, and a tetanic seizure that can cause death. As a treat, feed the lizard other insects on occasion such as wax worms (fatty, poor source of nutrition), super worms, mealworms. Crickets and mealworms can be pre-fed or gut loaded to improve the nutritional value. Hatchings are fed daily with small crickets, worms, flies and moths. Also provide some greens with a calcium and mineral supplement. Provide a vitamin supplement 1x per week. For juveniles, dust insects before feeding with the calcium powder immediately before feeding the lizard. Adult pet Bearded Dragon feeding should occur every 24 to 48 hours. Pinkie mice can be fed to the bearded dragon after 4 months of age. Younger lizards are fed smaller, younger mice. Mice can be provided 1x per week. There are several fruits that can be used as a treat. Remove pits and seeds before feeding to your lizard. Juveniles require a calcium supplement that does not contain phosphorus or vitamin D). Provide the Bearded Dragon supplement 3x per week. Also provide a reptile multivitamin 1x per month. Both can be sprinkled on the salad ingredients described above. Also dust any insects right before feeding. Adults on a combination of leafy greens, gut loaded dusted insects and occasional pinkie mice should get a 1x per week calcium supplement and 1x per month multivitamin supplement. The Bearded Dragon communicates by moving the body. If you observe behaviors such as a bobbing head, flattened body or tail whipping, the lizard is communicating submission to you. Do not keep two males in the same cage. One male can be kept with two females. Baby Bearded Dragons: Life by placing your finger under the shin and body. Babies will cling onto the finger. Then transfer to the hand with the Bearded Dragon pointed at the fingers. Don't hold to tightly. Trap by cupping the hand. Adults: Carry by the body by scooping them up. Keep the head facing the fingers. Support the tail. Over time, the lizard will get used to handling. Always wear gloves to avoid scratching the skin on the rough lizard skin. Bring a Bearded Dragon to a veterinarian after buying the lizard and then every year. The vet will examine a feces sample at the annual visit. 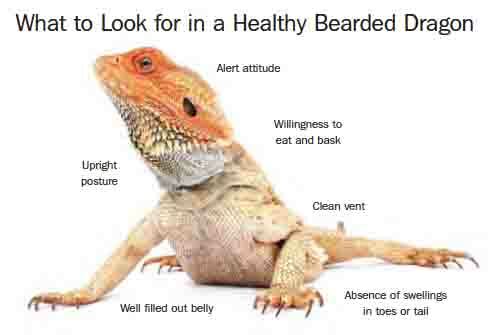 The following are common Bearded Dragon Health issues. If you have a specific question, fill out the form on the bottom of this page and our veterinary adviser will answer it for free. For urgent questions, we suggest using this online veterinary service is that available 24 hours a day. Parasites: Bearded Dragons commonly come down with parasites such as pinworms, coccidia and flagellated protozoa. Parasites cause gastrointestinal issues such as changes to the feces. Impaction: This is where the gastrointestinal tract becomes blocked. The condition is treated by swabbing the lizards cloacal, or via rehydration, enemas or surgery. Nutritional Problems: The biggest health problem with a Pet Bearded Dragon is calcium deficiency. (called calcium metabolism disorders). Treatment for calcium deficiency includes oral or injected calcium supplements. Reproduction Problems: A veterinarian will check for any physical problems such as a malformed pelvic bone or over sized eggs. Bearded Dragon Eye Problems: Bearded Dragons commonly come down with conjunctivitis and an infection called blepharospasm. Foreign objects in the cage can also irritate the cornea. For eye infection or scratches, the eye can be cleaned with saline and then a topical antibiotic can be applied. Bearded Dragon Skin Problems: The skin can be affected by bacteria or fungal infections. Topical antiseptics are used for bacterial skin infections. Fungal infections are yellow in color and are referred to as "yellow fungus disease." Treatment for yellow fungus disease is not effective, with many Bearded Dragons failing to recover. Injury: Cuts, abrasions and burns are common. Fractures can also occur when a cage rock lands on the lizard. Trauma is treated based on severity. Behavior: Dominance problems are also common if two males are housed together. Signs of stress due to dominance include weight loss and a decline in condition. Have a Lizard or Bearded Dragon Question for our Vet? We Will Answer it for Free! For more information download this Inland Bearded Dragon fact sheet and guide to Bearded Dragon Care. Also review our guide to Pet Lizards.